Ancient Incan ruins, Amazon rain forests, snow-capped Andes, the world’s highest navigable lake, the UNESCO World Heritage Site Machu Picchu – Peru’s appeal is endless. It’s pretty clear why Peru is top of the bucket list for so many world travelers, but the cuisine is also gaining a fan base all its own! On a two-week trip, my husband and I immersed ourselves in the flavors of this amazing country. We began with a short flight from Lima to Cusco where cultural heritage and spirituality remain strong. Traditions remain strong amongst native Peruvians (called Quechua) from their colorful attire to their exceptional hand-woven handicrafts and foodways. From Cusco, we took trains to visit the ancient citadel of Machu Picchu and the highlands of the Sacred Valley before returning to bustling, modern Lima. 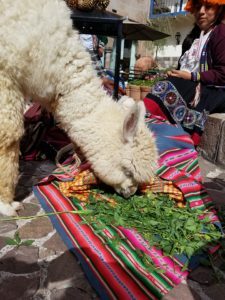 There is a lot of ground to cover and cuisine to devour in Peru, so here’s a little rundown of the highlights! Formerly the capital of the Inca empire, Cusco (or Cuzco) is filled with historic cathedrals and museums. At 10,825 feet altitude, it’s best to acclimate slowly to the thin air by taking it easy at first and staying well-hydrated. Many hotels offer cups of coca tea (made from local coca leaves which you can also chew) to help alleviate symptoms of altitude sickness. You’ll want to explore the hilly side streets, so a pair of comfortable shoes is key. Hire a guide to explain the historical significance of the city’s landmarks and to drive you to the nearby Incan ruins of Sacsayhuamán, Quenko, Puka Pukara and Tambomachay. Doing so will add exponential value to your visit. Cusco is also home to the renowned San Pedro market, designed by French architect, Gustave Eiffel. It is an open food market where local Cusqueños shop to stock their kitchens with fresh fruits and vegetables, meats and cheeses, coffee, sweets, and spices. Start your day here to pick up items for a picnic or just stroll around and try one of the many food stalls. Cusqeña food includes plenty of potatoes and corn, both abundant in Peru. Specialty dishes include anticuchos (grilled skewered beef hearts), grilled lomo (meat), alpaca, cuy (guinea pig), lake salmon trout, and causas (salad of fresh fish over a bed of mashed potatoes). Located 2,420 meters above sea level in a rainforest amidst the Andes Mountains lies, remote Machu Picchu. Considered one of the finest architectural examples of the ancient Inca civilization, it is a breathtaking ecosystem of diverse flora and fauna. This UNESCO World Heritage site draws spiritual pilgrims and tourists from around the world; so many, in fact, that Peru is doing its utmost now to protect this sacred site from too much foot traffic by restricting the number of visitors. You can access Machu Picchu only two ways: by foot on a multi-day trek through the Inca Trail, or by train to Aguas Calientes and then a morning or afternoon bus. Either course you choose, get there while you still can! Peru Rail and Inca Rail trains depart early from Cusco and Ollytaytambo to Aguas Calientes at Machu Picchu Pueblo. Some make this a long day trip from either town, but why rush? 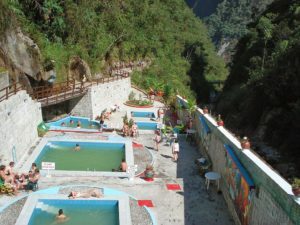 Spend a night in Aguas Calientes and let the experience soak in (literally, as the hot springs are what gave the town its name). Explore the dozens of stone sculptures telling the story of the Incas. Take a soothing soak in the namesake hot springs. Stroll around and check out the cafes and curio shops bordering the railroad tracks winding through the main street. Strict regulations require visitors to enter Machu Picchu with a licensed guide and ticket and limit what you can bring (no selfie sticks). 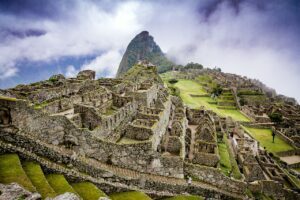 Reserve four to six months in advance at www.machupicchu.gob.pe, or ask your hotel concierge to help you schedule a tour. Our hotel, Sumaq Machu Picchu, arranged for a shaman (spiritual guide) who explained the sacred significance of the rock formations and made offerings to the Andean Earth Mother (Pachamama). I’d recommend this more enhanced experience over joining a tour group if you want to learn more about the spiritual aspect of this landmark. The vast Sacred Valley, about 15 kilometers from Cusco, is another center of the Incan empire and an important area for agriculture and archeological monuments. 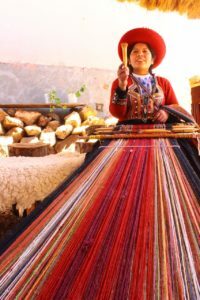 Small colonial towns like Ollytaytambo, Urumbamba, Pisac, and Chinchero are filled with local attractions and colorfully attired Quechua selling handicrafts. Many additional important sites dot the drive along the way as well. One is Moray, an amphitheater of bowl-shaped, concentric stone terraces thought to have served as an agricultural laboratory for the Incas. Salineras Salt Pans is another, which is a steep centuries-old salt mine where you can purchase packets of local salt. A hired car with driver and guide are recommended. Local restaurants serve freshly prepared, inexpensive, Andean fare such as quinoa soup, grilled alpaca, beef, and local vegetables. Make sure to try choclo (a boiled cob of large kernel Andean corn) sold by quechua women from street carts. A bustling metropolis and the capital of Peru, the diversity of Lima’s cuisine cannot be underestimated. Proximity to the Atlantic Ocean brings incredibly fresh fish and various renditions of ceviche. Asian influences can be found in Chifa (Chinese-Peruvian) and Nikkei (Japanese-Peruvian) cuisines. The Spanish influence can be found in meat, pork, and chicken dishes. You’ll find a range of restaurants offering everything from traditional and contemporary, to eye-popping art-on-a-plate. Your visit will most likely center around four neighborhoods: Barranco is the laid-back arts district filled with cafés, bars, and galleries. Miraflores and San Isidro have beautiful parks, upscale shopping, and many top restaurants. And El Central is the historical district with storied cathedrals and museums. Peru is a delicious feast for the senses, from its cultural heritage to its culinary offerings. It’s an unforgettable journey worth savoring slowly to enjoy every moment. Chicha: Chef Gastón Acurio’s Chinese twist to cusqueño dishes like lomo (beef) stir fry and cuy (guinea pig) in fried rice. No reservations. LIMO: Peruvian-Japanese Nikkei cooking with excellent tiraditos. MAP Café: A romantic high-concept restaurant inside the Museo de Arte Pre-Colombino (MAP). 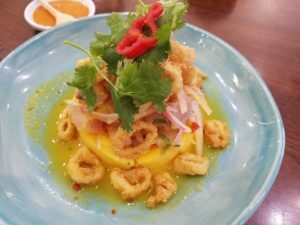 Morena Peruvian Kitchen: Traditional Peruvian classics, from causas to quinoa chowders. Museo del Pisco: Learn about Pisco and enjoy cocktails and lighter fare. Q’unuq at Sumaq Machu Picchu Hotel: Beautifully presented fusion-Peruvian dishes using locally sourced ingredients and an excellent special tasting menu. The Treehouse Restaurant: Small and romantic with inventive nuevo Andean cooking. El Huacatay (Urumbamba): Creative Andean-fusion menu (e.g., blackened salmon trout over avocado salad). Quenela (Urumbamba): Andean dishes like grilled beef with sliced avocado and tacu tacu (pan-fried seasoned rice and bean patty). No website. Tawa (Urumbamba): Andean dishes including chicken causa, quinoa avocado salad, grilled lomo. Mil: A new restaurant opened by Chef Virgilio Martinez (Central) located near Moray at 11,500-foot altitude features “ancestral cuisines” of the Andes. Astrid & Gastón Casa Moreya (San Isidro): Gastón Acurio is a celebrity chef with many restaurants to his name (including La Mar listed below). Astrid is his wife and a talented pastry chef. The restaurant, located in a restored colonial mansion, offers a 29-course tasting menu. (book well in advance). 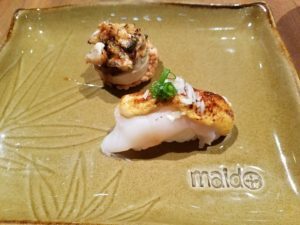 Maido (Miraflores): Chef Mitsuharu Tsumura specializes in Peruvian-Japanese Nikkei cuisine. Choose between a tasting or á la carte menu. (book well in advance). 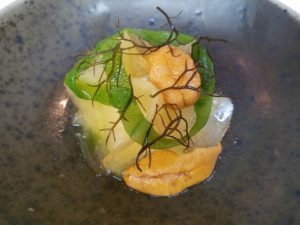 Malabar (San Isidro): Chef-owner, Pedro Miguel Schiaffino’s menu is inspired by both the Andes and the Amazon at this staid restaurant. He also owns ámaZ in Miraflores, which also features an ecosystem-driven menu. La Mar (Miraflores): Ceviche bars-restaurants in Lima are only open in the afternoons. Arrive early at this hot spot and consider eating at the bar. No reservations. Peruvian Pisco is a clear distilled spirit made from the fermented juice of native grapes. 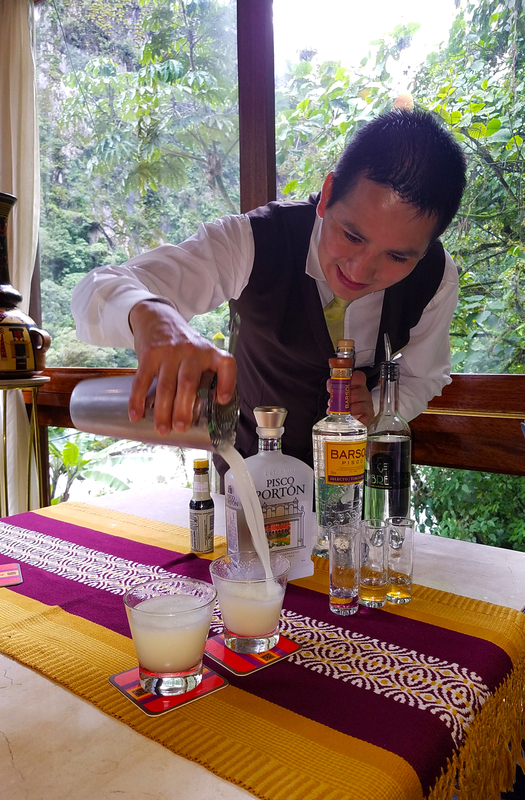 Try a Pisco Sour, the signature cocktail of Peru (similar to a Whiskey Sour), or Chilcano (Pisco, ginger-ale, lime, and bitters). Wines lists are mainly South American; some feature well-known European and California producers. 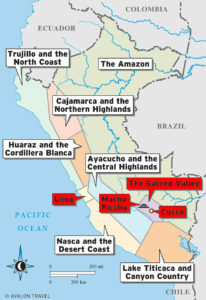 Make sure to try some Peruvian wine, produced in the Ica Valley south of Lima. 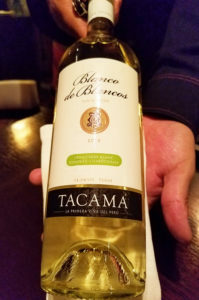 The best-known label is Viña Tacama which produces a zesty Sauvignon Blanc to pair with ceviche and other seafood dishes. Let The Delicious Times Roll!